Stanza seems to be a generally well regarded ebook reader for the iPhone and iPod Touch. As it is available for both Windows and OS X, it attracted my attention. First I downloaded it on my MacBook but it is so minimalistic that it just seemed incomplete to me. As if development had been abruptly halted before the product was ready. As I ran into the snag that Baen sells some pre-release texts only in formats which are incompatible with the eReader software which I regularly used, I decided to give Stanza a chance again. I bought the books from Baen and started reading the first one of them. My opinion hasn’t changed much, though. Now, more than before, I have a feeling that the software isn’t really ready for mainstream usage, though it seemed promising. I say that it seemed so, in the past tense, because it seems that the company behind the software has been acquired by Amazon, which already has more than one initiative in this area. In the next days I’m planning on trying out Stanza on my iPod to see if, on that platform, it lives up to my, maybe exaggerated, expectations. This entry was posted in iPhone/iPad on August 26, 2009 by admin. Sony has released two new models of its Reader device. One of the new models is smaller with a 5 inch screen and is considered to be pocket model. This smaller model will cost $199, making it one of the cheapest alternatives for reading ebooks. Perhaps these new models can help Sony gain more traction in the market as it is currently in the shadow of Amazon’s Kindle. It would be interesting for Sony to gain more market share before Barnes and Noble starts offering a device of its own, next year. I hope to be able to see these devices first hand soon, but won’t hold my breath waiting for it. Sony doesn’t seem to consider Brazil as a potential market for ebook Readers as I’ve never seen one for offered for sale down here. For now, I’ll continue to consider my iPod as the best device for reading ebooks. This entry was posted in Kindle on August 6, 2009 by admin. I’m currently right in the middle of the process of setting up an apartment for my family to move to, within this month. As I have a sizable collection of books, the question of how and where to store them came boiling up as I realized that while I’m moving to a larger apartment, it’s got no bookcases. This got me into thinking about my book reading and buying habits over the last few years. It seems that it wasn’t without reason that I decided to write about eBooks as the vast majority of the books I’ve read over the past four or five years where ebooks. The great exception here are the books I buy while traveling abroad, to read during the flights. While ebooks don’t require bookcases and therefore aren’t really troubling me for this imminent move, their portability is still quite a bit of a nuisance. I’ve got a large number of titles in Mobipocket format, but Mobipocket is dragging its feet on support for the platforms I now use: iPod/iPhone and OS X. Sure, I can get around the OS X through the use of the Windows version within a Virtual Machine, but not such work around is available for my iPod. This entry was posted in iPhone/iPad on July 11, 2009 by admin. One of the first things I did after I got an iPod Touch was to install eReader on it. Actually, it might have been the first application I installed, though I can’t be totally sure. I have been reading books electronically for a long time as I have always been a big believer that this is the inevitable future of books. I’ve read a lot of books on my PocketPC and on notebooks and now that I’ve got some on the iPod I feel we are getting closer to what I used to envision for this technology back in 1997. Back then I set out to create both an ebook reading and a creation software. I was certain that the future was all about buying books on the Internet and immediatelly downloading them to your reading device. As these devices were not immediatelly available I was writing a PC version of what I though the device should do. It was a lot of fun, even though it didn’t really go anywhere as we were not able to raise capital to really startup the busines. Still, this early experience, and the fact that I just “believed” that this was the future, made me follow advances in this area closely and made an early adopter out of me. Through these years I’ve always maintained that what was really needed was a device that was light and thin, but that still had a big enough screen to be confortable to hold and read. The Kindle DX is a step in the right direction, as far as screen sizes go, but it is also a step in the wrong direction in respect to price and functionality. If I am going to carry a device of tha size around and pay that much for it, I expect it to do a lot more than allow me to read. The iPhone and the iPod Touch are a step in the right direction in regards to the functionality of the device and even in regards to price, but still have a small screen. Now, if Apple only released a Kindle sized device with the capabilities of the iPod Touch we would be just about where we need to be get the masses to really take to reading electronic editions. This entry was posted in Future, iPhone/iPad, Kindle on May 9, 2009 by admin. Amazon introduced this week the Kindle DX. 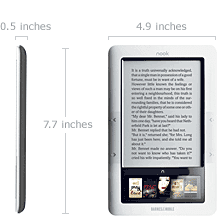 The new product is essentially a much larger version of the Kindle 2 with the capability of displaying native PDF files. You can expect that without the need to make the document fit on the smaller screen of the Kindle and still be readable the reading experience will be much better. Early pictures show great looking images of newspapers and we can expect that textbooks will be much more at home in this new device. In fact it seems that Amazon is specifically targetting newspapers and textbooks with this new device. This strategy makes a lot of sense to me, as these publications don’t really fit well on a small screen. The price of this new device, on the other hand, is a bit puzzling. At $489.00 the Kindle DX is too expensive to become a mass market phenomenon. I can only image that it is the e-ink display that makes the device so expensive as you can get great netbooks a lot cheaper. This entry was posted in Kindle on May 9, 2009 by admin.